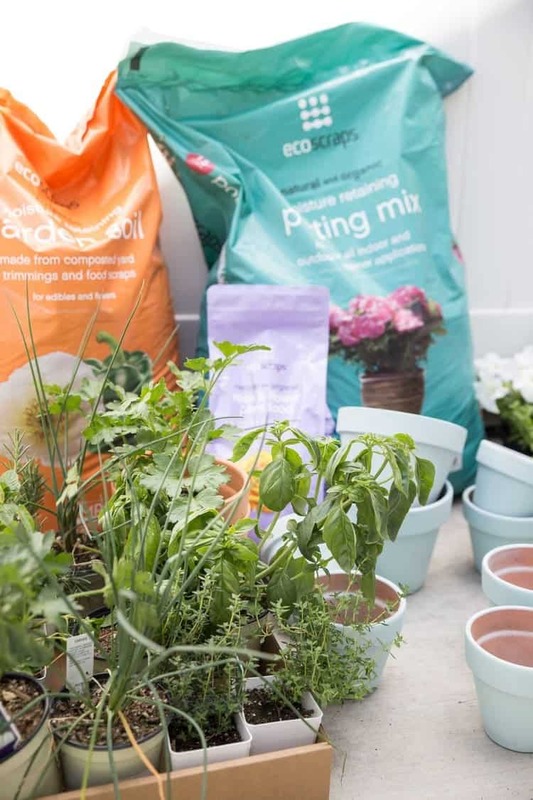 THIS POST IS SPONSORED BY ECOSCRAPS. THANK YOU FOR ALLOWING ME TO CONTINUE CREATING GREAT CONTENT FOR YOU BY SUPPORTING PARTNERSHIPS WITH SUPER AWESOME BRANDS THAT HFHL LOVES TO WORK WITH! AS ALWAYS, OPINIONS REMAIN 100% MY OWN. Summer is literally right around the corner, and I believe in celebrating the warm months with a refreshing drink in one hand and a good book in the other. Make sure you have at least one hand filled with this delicious cocktail. And make sure you stay tuned in till the end to find out how you can get the ingredients right from your own herb garden! Plus there’s a giveaway at the end!! I know, I know – it’s not quite peach season yet. I totally know this. But it’s right upon us, and I am lucky enough to have had some peach puree in the freezer from last year. 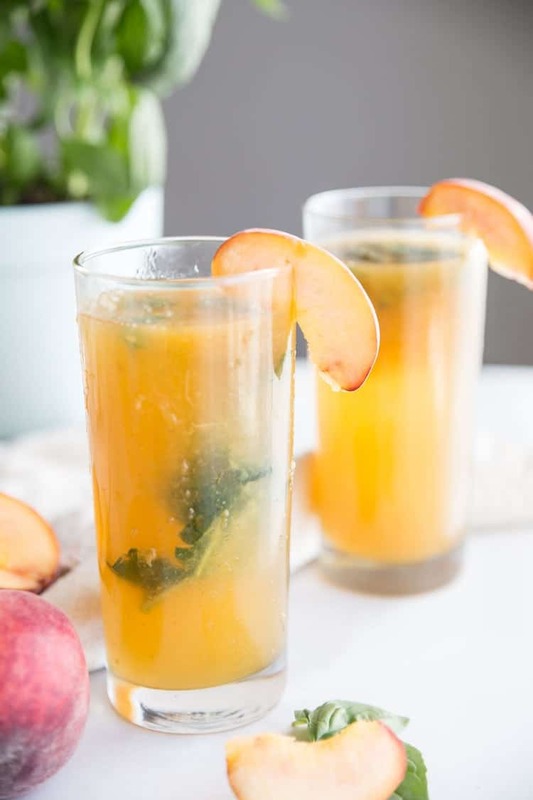 It was still so sweet, fresh, and ready to kick summer off in a flavorful cocktail that’s absolutely perfect for this BBQ season. 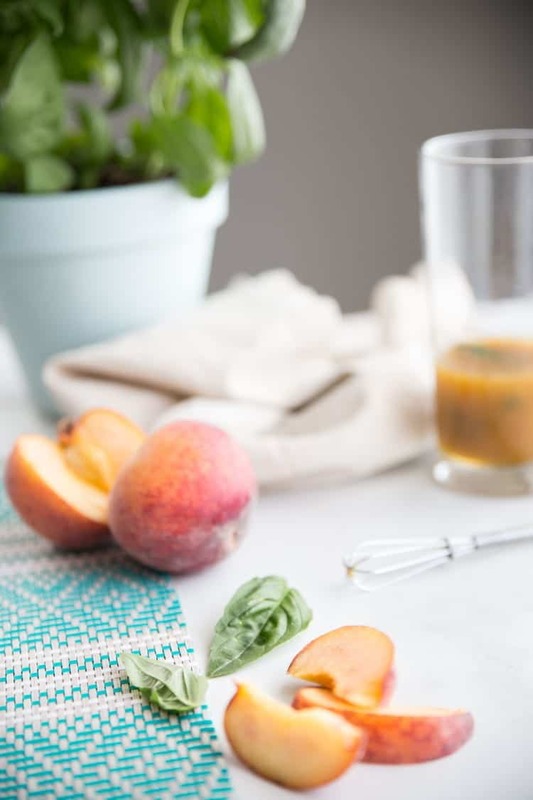 Peach and basil is definitely not a popular flavor combination that you hear about all the time. In fact, you may be wondering if I’m off my rocker with this one. Let me tell you how I came to love the combo. A couple of years ago, wife and I were at the summer farmer’s market. I was taking in all the smells and all the flavors. I was enjoying samples. I was petting all the little doggies that passed me. I was smiling at all the babies that were being worn by their hippie granola mamas. Life was grand. I had a bag full of all my delicious local produce, and I could not wait to make the magic happen with them in my own kitchen. I wasn’t sure what was in store, but I knew it would be fresh and delicious. As we were walking out of the market, I stuck my nose into my bag just to take stock of everything I had. And that’s when it hit me. I had a combination that I had never thought of before, and it was going to be epic. I took in the sweet scent of the fresh peaches, and in that same breath the scent of basil wafted in through my nose. My senses have never been quite the same. I knew right then and there that I would want to turn this combination into so many things. I immediately made a Basil Peach Swirled Bread that I still dream about to this day. I’ve dreamt up ice cream, popsicles, pizzas, and sandwiches featuring the combo, and some of them will be on the blog this summer. But of course, we must start with a cocktail, because duh… summer is for all the cocktails. Every year, I try really hard to get to the market every single weekend. I tell myself I’ll get up early and go on Saturday mornings. It does happen sometimes. But definitely not as often as I’d like. So that means I don’t always have access to all the amazing fresh herbs and produce. That is why I decided to take matters into my own hands and bring herbs right to me… you know, to feed into the lazy so I don’t actually have to leave my house. I may not have the greenest of thumbs, but I am determined to make it happen this year by starting small. 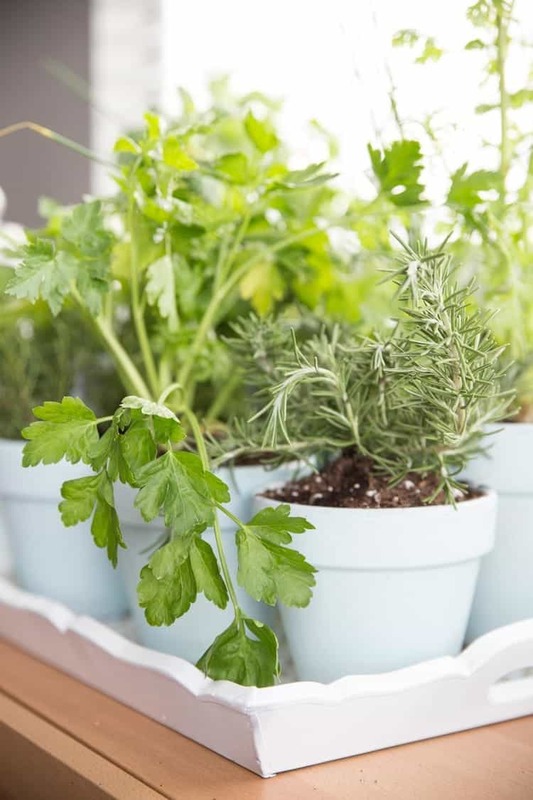 Just an herb garden that could stay indoors away from the elements. The thing is, after much research I found that most fresh herbs really thrive from the direct sunlight. But I don’t think the guides I read were really talking about the wrath of Utah’s sunlight… seriously – instaburn. So I wanted to create a little garden that would be easily transportable from inside to outside, even if it was just an hour or so a day. I got all my little plants (because duh, there’s no way I could manage growing anything from a seedling), my terra-cotta pots, and some key growing ingredients to make the best living conditions for my new little babies. There was definitely one key product I had to get my hands on … you know, only the best for my cocktail ingredients. I have got tell you how much I love EcoScraps brand products. I’m one of those people who thinks about the long-term effects of all the decisions we make as humans. Throwing our gum out the window… what’s going to happen to that gum? Will a bird eat it and eventually die? All the plastic bags used because we forget our reusable bags… how long will those take to break down in our environment? I don’t even want to think about it. And all the food waste. There’s SO much of it, and it’s filling up our landfills. In the United States, we waste 40% of the food produced. That is enough to fill the Rose Bowl every day. It sits in landfills producing methane, which is 20 times more harmful than CO2. Holy woah! I live in a small townhome with the smallest little slab of concrete for a yard, so the thought of composting is just really overwhelming. And that is why I’m a huge supporter of EcoScraps. I feel like it’s one way I can do my part for the environment. Since 2010, EcoScraps has been working to be a part of the solution by reusing this waste and keeping it out of the landfills. In other words, they take wasted food, compost it, and turn it into soil for consumers like you and me to use in our gardens! I don’t know about you, but that’s pretty dang amazing. I love that I don’t have to go out of my way to get it either. I was actually able to pick up all my herbs, pottery, and EcoScraps soil right at Walmart, which was a huge perk. I don’t know about you, but I do not have the time to be traipsing all over town for each and every little thing. 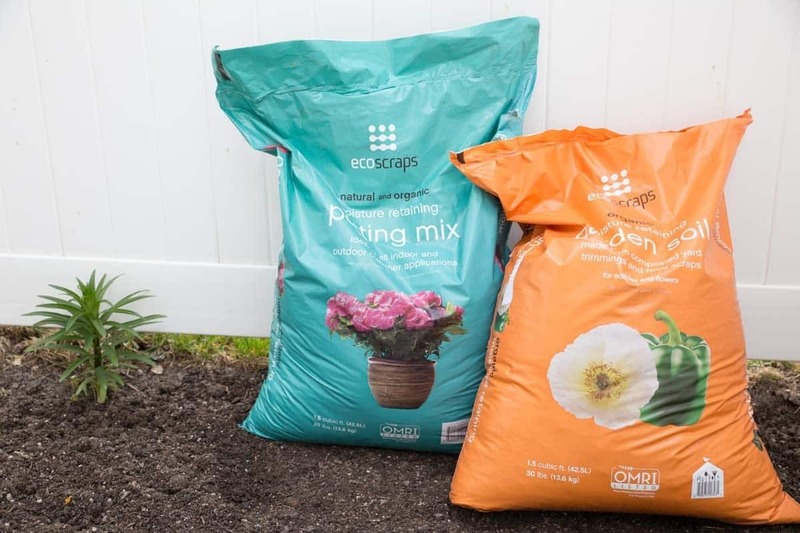 Make sure you check out Walmart’s page where you can even order your soil right online for pick-up later. That’s convenience I can get into! Once I got home with all my supplies, it was time to get to work! 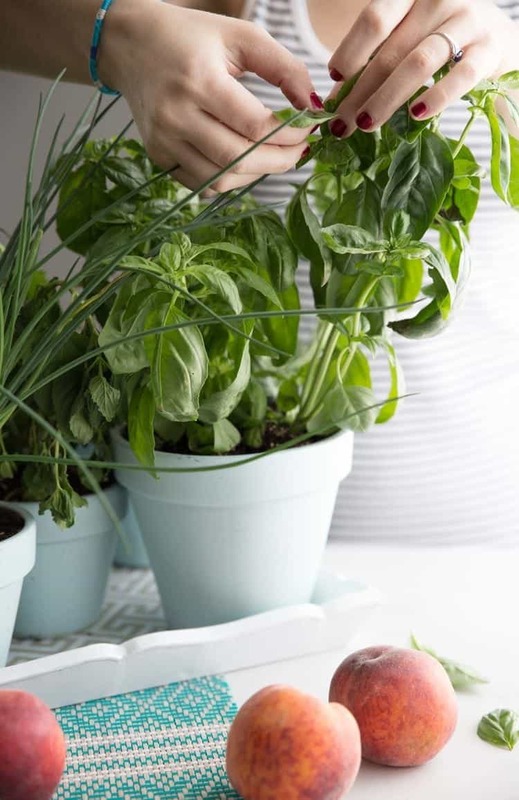 To make my herb garden work for both indoors and outdoors, these were the steps I took. I painted my terra-cotta planters with all-weather spray paint so they would be able to handle any elements if I accidentally left them outside too long. I painted a tray with the same all-weather spray paint for the same reasons. I also used mod-podge to seal some decorative paper to line the tray for added protection from water and dirt. I didn’t want to ruin my tray every time I watered my plants or took them outdoors. 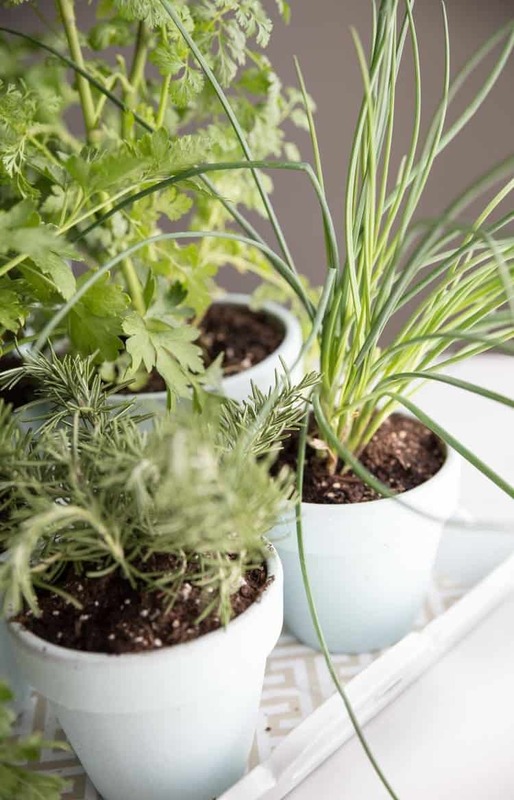 Once everything was dry, I planted pre-grown herbs that I knew would do well indoors: chives. mint, basil, parsley, thyme, and cilantro (although I’m not sold on the cilantro quite yet). I water them a little bit every other day and give them some outdoor time for about an hour every day right in the sun. 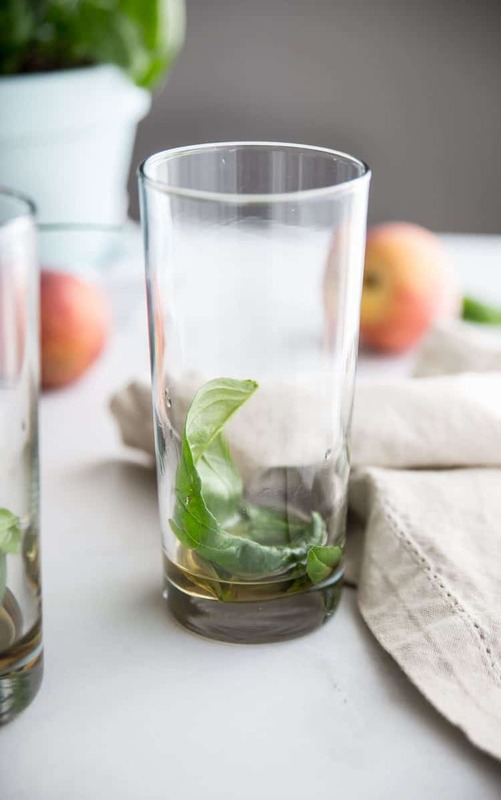 In a Tom Collins glass, muddle basil with agave until it is aromatic. 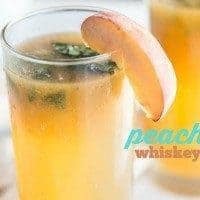 In a shaker, shake whiskey & peach puree with ice. Fill glass halfway full of ice. 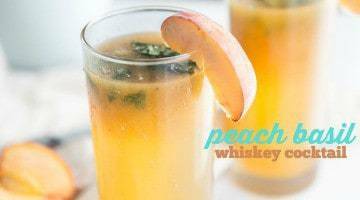 Pour the whiskey & peach mixture over the basil. Then fill to top with club soda. Recipe makes one cocktail. To make peach puree: Peel peaches, using the blanch method. Pit and place in a blender. Blend until a smooth puree is achieved. Refrigerate for up to a week or freeze for 6-12 months. Note on Agave: I enjoy using Tres Agave brand for my cocktails because it is already perfectly blended with purified water, making it easy to dissolve and mix into the cocktail. Where as regular agave is generally too thick to dissolve. If you'd rather, you could always make a simple syrup or even my Stevia simple syrup for a more natural option. If you make this recipe or try out an indoor/outdoor herb garden like mine, make sure you snap a photo and add it to Instagram. 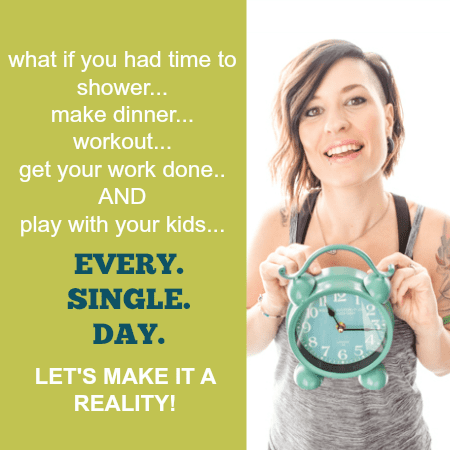 Don’t forget to tag me (happyfoodholly)! 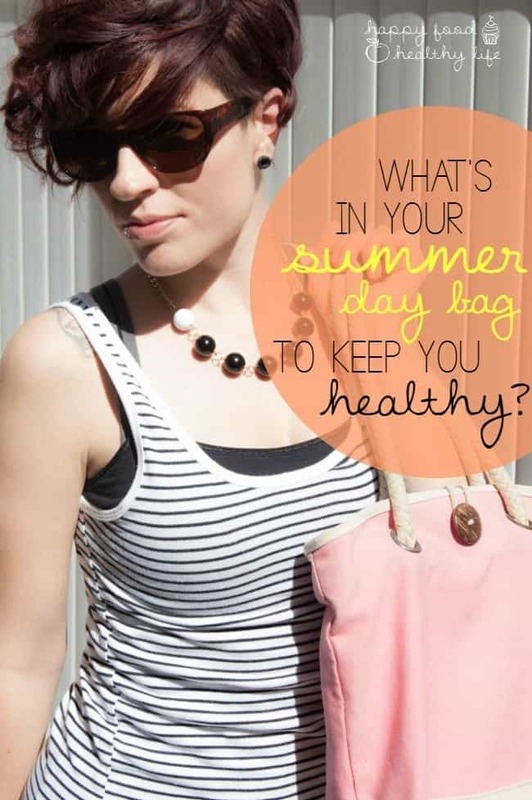 What’s In Your Summer Day Bag to Keep You Healthy? – Planning on being away from home and exploring during the summer days? Make sure you keep your bag stocked so you can stay as healthy as possible. 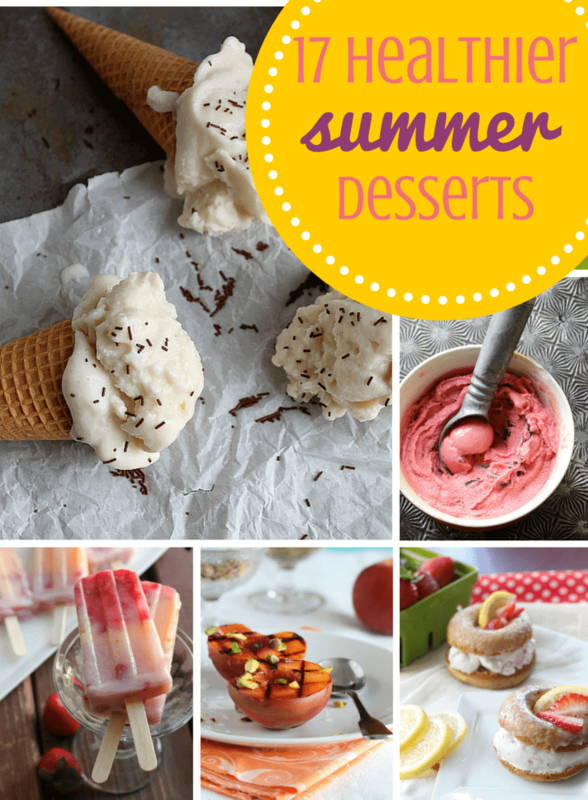 17 Healthier Summer Desserts – desserts that will keep you cool and are actually full of real food ingredients. If you liked this post, be sure to share on Pinterest, Facebook, Yummly, Twitter, and StumbleUpon using the buttons below. 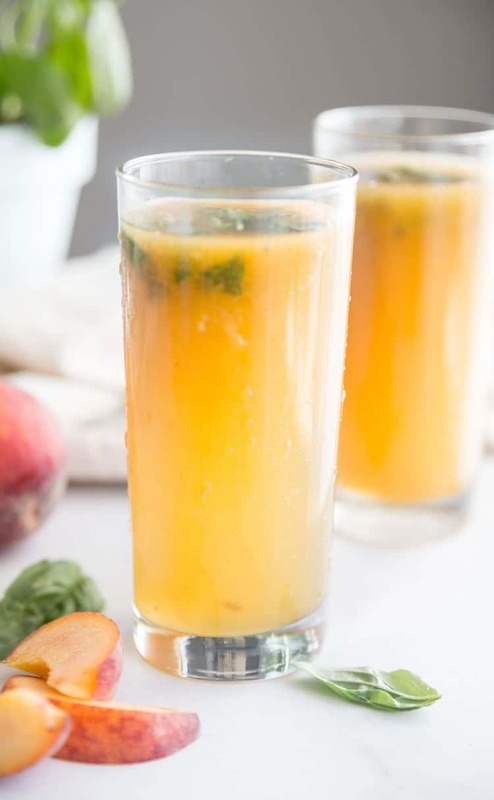 This cocktail looks so refreshing! I can’t wait to give it a try! oh you will not be sorry Marye! I love your little indoor/outdoor herb garden. 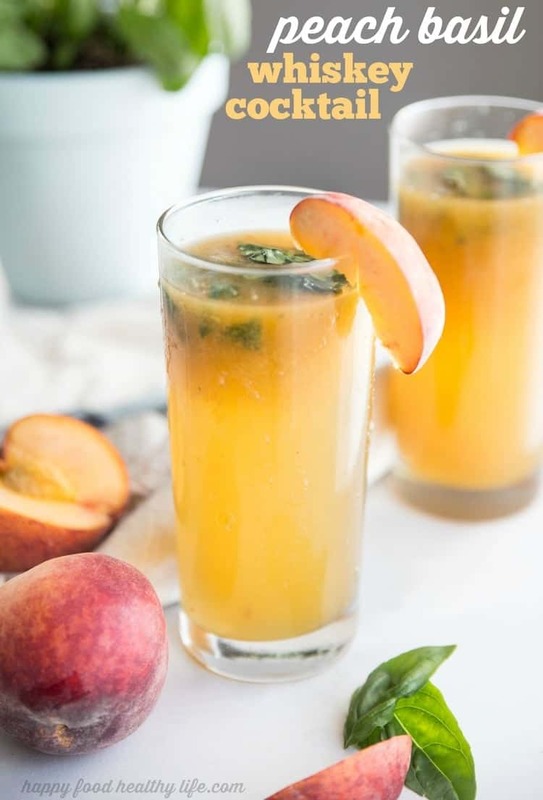 It’s so nice having fresh herbs to use in cooking or amazing cocktails like the basil peach whiskey one! 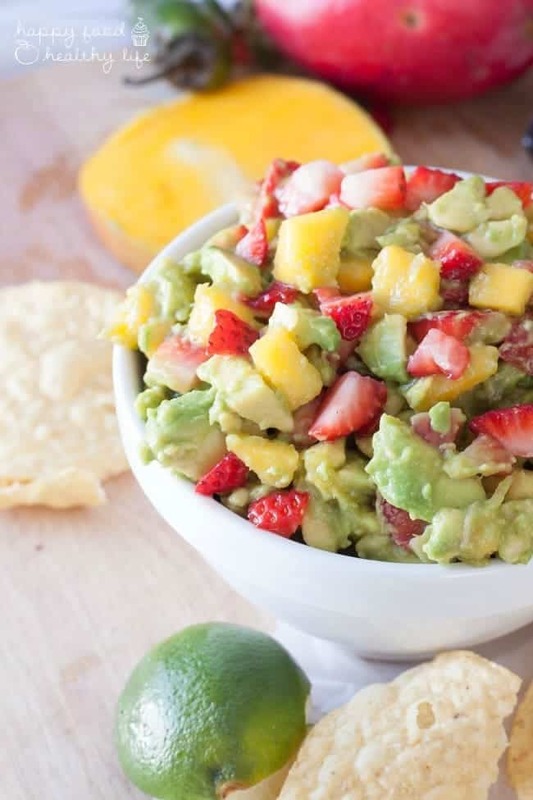 I’ll be trying this one this weekend, I’ve got everything to make it! Thanks Danae! I love my herb garden too. Having that added freshness into my recipes always makes me happy. Let me know if you try it out!